I've been doing genealogy for quite a while, but am new to DNA, having purchased six tests for Christmas. Not all results are in yet, but I have a few good matches. I'd like to get four more kits in the next year, but my wife and I have lots of relatives, and I'm not sure who to test next. I've created a chart to show the DNA resources (living relatives) available to us. My wife (3a) and I (2a) tested at AncestryDNA, and have twelve living aunts and uncles, ages 75 to 90. They all have living cousins, although their numbers are dwindling. My mother (5a) and my wife's father (6a) are also at Ancestry, and my wife's mother (7a) is at FamilyTreeDNA, because we didn't think she could do the spit test. I have one FamilyTreeDNA kit left over. My cousin (5c1) tested herself at 23andMe, but I have no presence there, yet. The experts are preaching to test everyone, everywhere, with every test. I'd rather be more frugal, and am only doing autosomal tests for now. I'd like the option to do mtDNA and Y-DNA in the future. Confirm paper genealogy. Find 3rd/4th cousins to trade stories/photos. Find distant cousins to break through brick walls. Map Chromosomes and traits of individual ancestors. Preserve DNA data for future generations. I've considered testing myself at all three big companies (Ancestry, FamilyTree, 23andMe). Is it better, worse, or the same if I test myself (2a) at Ancestry, my sister (2b) at 23andMe, and my brother (2c) at FamilyTree? Would aunts and uncles be better than siblings in question 1? I'd like to recreate a partial DNA profile for my deceased father (4a) using my siblings. Is there a benefit in that to our (hopefully) ongoing genetic genealogy, or am I being sentimental? He has three living brothers. Experts say to test your oldest relatives first. The thought being that eventually you'll test everyone, and maybe I will. But being old doesn't make you best choice. 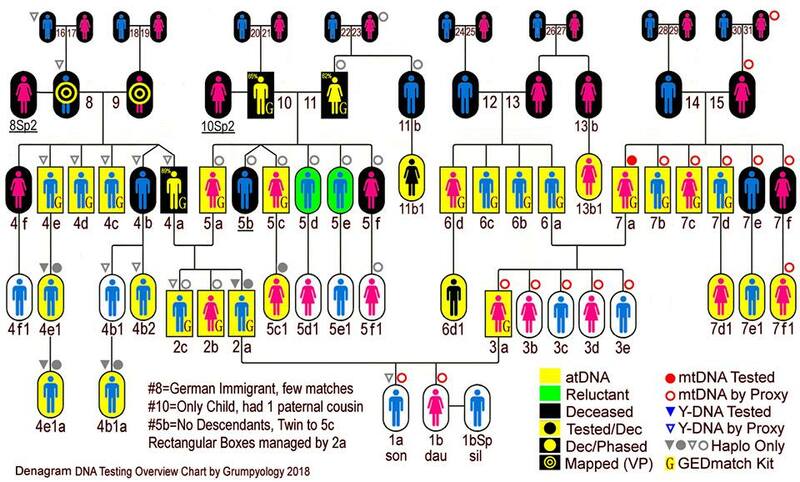 If you could test only four people on the chart for atDNA, who would it be, where would they test, and why? Who would be runner-up in fifth place? UPDATE: I've come a long way in the last 6 months. Here is my family's latest denagram, showing who's been DNA tested. Thanks for all the help! But seriously, yes, there are some things you should do and do as soon as possible (i.e. before the candidates are no longer here). Seeing your goals, I would suggest you work towards trying to get sets of three siblings tested at your parents level. The reason for this is that once you have 3 siblings, you can do what's called Visual Phasing. Blaine Bettinger has a great guide to this. What Visual Phasing can do is assign the DNA of three sibling to each of their grandparents. 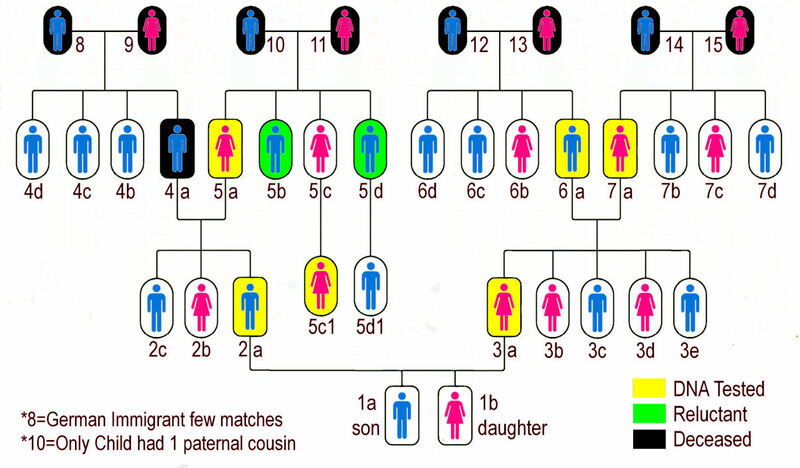 If you do it with a parent and two aunts/uncles, then you will get chromosome maps of your 4 great-grandparents on that parent's side. (The rest of us are drooling right now). Since your father has passed away, you should get his 3 brothers tested. You've tested your mother. You've tested her niece, but not her sister, and her two brothers are reluctant. You should try to get two of her siblings if possible. Using her niece and getting her sister and nephew might allow you to map some or even most of your mother's grandparents, but it would be more difficult and require customized work. On your wife's side, both her parents have 3 siblings and you should choose 2 of her father's siblings and 2 of her mother's siblings. That's a total of 3 + 2 + 2 + 2 = 9 tests. If that's more than you want to do, you can prioritize them, but remember that if they pass away, you won't get the chance. If you are interested in future Y-DNA or mtDNA analysis, then Family Tree DNA is the best. But you only need one male on each of your 2 sides and your wife's 2 sides to test there. You can do both tests with the male sample. You might want the other uncles and aunts you test to be at Ancestry DNA, just because they have the biggest pool of possible relatives. You can later transfer the raw data for them to Family Tree DNA and MyHeritage DNA and Living DNA for free to take advantage of those pools. Whereas, you cannot transfer raw data to Ancestry DNA from other companies. But for the purposes of Visual Phasing, don't test them at 23andMe. 23andMe use the V5 chip, which I'll explain in the next paragraph. Once you have 3 parent/aunt/uncle combinations for your father, mother and your wife's father and mother all tested at Family Tree DNA and MyHeritage DNA, then you can transfer their raw data all up to GEDmatch.com for free. That is the site where you do the Visual Phasing from as Blaine Bettinger describes. Currently at GEDmatch, they are only experimenting with the V5 chip, so uploads from that chip (23andMe and Living DNA) are kept in a separate work area that cannot currently be compared to DNA of the other companies. Now, with respect to this workflow I propose, I'll answer your questions. Don't bother testing yourself at other companies. Instead, just transfer your raw data to Family Tree DNA, My Heritage DNA, Living DNA and GEDmatch for free. Another test at a different company will not give you enough extra to make it worthwhile over a transfer. If you test siblings, you will get different cousin matches. You might choose to test them also at Ancestry DNA, or at different companies and transfer them everywhere else. You won't be able to transfer them to Ancestry DNA, but Ancestry DNA doesn't provide good tools for you to use anyway. Yes! Aunts and uncles are much better than siblings. With siblings you can only map your grandparents' segments. With aunts and uncles, you can map your great-grandparents' segments. People who don't have any parents or aunts or uncles living don't have a choice, and getting siblings tested is what we unfortunates have to do. You don't need to. If you are successful using Visual Phasing from your father's 3 brothers to map their grandparents segments, then you really have everything you need. No, you won't know all of which parts of your dad's DNA he got from his grandparents, but from all this information, you'll be able to determine exactly what he passed down to you and what your mom passed down to you. If you want to determine the rest of your dad's DNA, then as you say, you could test your two siblings and do the Visual Phasing with them but now you're talking about moving from a 4-star hotel to a 5-star hotel. If I had only 4 people to test, I would choose your father's 3 brothers to nail down his side, especially since he is gone and you have no one else close who tested on his side. The 4th would be tough because you only have 1 sibling tested on each of the other sides and you can't get up to 3 with just one more. I'd probably take one who is not well and may be gone in a few years. In my case, I tested my uncle last year with his permission when he was 93 and he passed away 6 months later. Other than losing them, the real reason why they say to test the oldest first is you want to start a generation farther back. The extra generation means that they will on average match twice as much to each relative as the next generation will. If you get a 5th, then pick the aunt or uncle that gives you 3 siblings. Visual Phasing is tricky, but I'm sure you'll get the hang of it. I wish I was in your boat. I'm going to write a more simplified and generic answer about the process of answering the question, for people who have similar problems. You don't have these goals ranked by priority. Doing that, and thinking about each one specifically, may help clarify which people you want to test in the future, and which ones you want to test right now. For instance -- one goal is to preserve DNA data for future generations but that is broad, and gives you a reason to test everyone. It's important when you consider the terms and conditions of a specific testing company, e.g. how long might they store the samples of deceased relatives? Other than losing them, the real reason why they say to test the oldest first is you want to start a generation farther back. The extra generation means that they will on average match twice as much to each relative as the next generation will. To decide where to use the remaining kit from FamilyTreeDNA -- I'm assuming this is their Family Finder (autosomal) test -- you could use the same reasoning as before (hold it in reserve for someone who can't take a spit test), or choose for another reason, like wanting to use their specific tools for a particular individual. Roberta Estes' posts Which DNA Test is Best? from April 24, 2017 gives a snapshot of what tools were available at the time her post was written. When reading her post, or any other review (including our answers), it's crucial to keep in mind when the piece was written, since the DNA testing company 'landscape' is changing all the time. For instance as of April 2017 when Estes wrote her post, MyHeritage did not have a chromosome browser, but they have one now -- it was announced at RootsTech 2018. To meet your goals Find 3rd/4th cousins to trade stories/photos. Find distant cousins to break through brick walls., you want to get yourself into as many testing pools as possible. Transferring test kits when possible is likely to be cheaper, and gives you a consistent data set across the platforms. Answering the question of whether an individual should take tests from more than one company depends on what SNPs are tested at each company, and how much you want the data from that specific test. The additional information you might gain that way will be small and may not be cost-effective for your needs. Just as any other question here, you can get better answers for yourself by narrowing down the question and making it more specific. I highly recommend looking at the case studies of other genealogists who have combined paper trail genealogy and DNA, so you can see how they work. You can take a look at the DNA sessions from RootsTech by checking the 2018 Schedule and the RootsTech 2018 videos. Many genealogical societies have webinar series which offer free access to the public during the live broadcast -- you can find them by looking at the Geneawebinars calendar or other calendars of genealogy events. Legacy Family Tree Webinars are available by subscription or by purchasing digital downloads of individual webinars. Each new webinar is free to the public for the initial broadcast, and the recording is free for the first seven days. Their webinar library includes a basic Foundations course of five webinars by Blaine Bettinger. They host the BCG webinars, and since the purchase of Legacy by MyHeritage, a series of webinars sponsored by MyHeritage. Usually the handouts for the webinars are members only, but check the BCG webinars in case the syllabus can be downloaded for free. Formulating a DNA Testing Plan by Blaine Bettinger, scheduled for Wednesday, March 28, 2018. He plans to talk about how to minimize costs while maximizing results. The Family DNA Project by Nicka Smith, scheduled for Friday, June 08, 2018, on creating and managing a DNA project for your family. Better Together: Making Your Case with Documents and DNA by Patti Lee Hobbs, CG, a BCG webinar scheduled for Tuesday, April 17, 2018, will talk about combining DNA evidence with the paper trail. Systematically Using Autosomal DNA Test Results to Help Break Through Genealogical Brick Walls by Tom Jones, PhD, CG, CGL, a BCG webinar presented on October 6, 2017, discusses a case study from the early 1800s. Avoiding Genetic Genealogy Pitfalls by Blaine Bettinger, presented on July 17, 2017, discussed the problems of not testing close relatives. MAXY DNA: Correlating mt-at-X-Y DNA with the GPS by Debbie Parker Wayne, CG, CGL, a BCG Webinar presented May 16, 2017, talks about correlating data from all the different test types with your paper trail research. Weaving DNA Test Results into a Proof Argument by Karen Stanbary, CG, a BCG webinar presented February 21, 2017, shows how to combine autosomal test results with paper trail research. FAN + GPS + DNA: The Problem-Solver's Great Trifecta by Elizabeth Shown Mills, a BCG webinar presented October 7, 2016, shows how to combine DNA results and the study of friends, associates, and neighbors. Seeing the kinds of problems the professionals solve using DNA, and how they formulate a testing plan, is a huge help when you're struggling with making a testing plan of your own. It is difficult question. Unfortunately, there is no general solution. Of course the ideal choice is to test everybody with WGS (whole genome sequencing) test. It will reveal the maximum amount of information about your family. There are only two drawbacks: it is very expensive and with WGS test you will be able to match other users only with free (or almost free) databases like GEDMATCH, YFull and so on. You should decide if you would like to test for yDNA-mtDNA and atDNA the same persons, or test different people for different types of DNA (it gives you more agility in future, because, for example, with FT-DNA you could upgrade your tests). Also if you want to confirm the relationship between son and father (or daughter and mother) you are strictly forced to buy atDNA (or WGS) test for both, because of possibility of NPE (non parental event). Another idea is that some tests are equivalent. For example, BigY from FTDNA test reveals the maximum possible amount about yDNA, but Y Elite from FGC is superior because it will also tell the information about mtDNA for almost the same price. Please take into the account that you not obliged to order all tests from the same company. You could order atDNA test from different vendors like 23andMe, FTDNA and others. It will give you access to databases of matches of every commercial lab. And you always can upload your data to free database because you will have access to RAW data of test. I just wanted to clarify that "oldest living" means "members of the oldest living generation", rather than "oldest living individuals", since the closer the samples are to the ancestors, the better the cousin matches. I assume that's understood, but with all the repetitions of "oldest living", I wasn't sure. From this tree, with 4 kits, I would autosomal test 2 people from the 4b-4d group (to get 2 from that generation), plus 6c and 7b (who already each have a tested sibling). I have a preference for testing female relatives, as autosomal tests include X chromosomes but not Y, so female samples get a bit more results there. My own y-DNA testing experience has been mixed, so I'm personally not big on them, but other folks' mileage may vary. Testing with different vendors is intriguing - I've mostly been frustrated that I can't easily compare matches across vendor platforms (unless I can convince everyone involved to use GEDmatch, which is not typical). I'm partial to AncestryDNA despite their lack of tools, just because their sample pool is so much larger than the others. As I presume everybody already knows, raw DNA data from AncestryDNA and 23AndMe can be uploaded to both FamilyTreeDNA and MyHeritage. Last I knew, FamilyTreeDNA charged $20 to get the full benefit of an uploaded sample (still much less than the cost of their kits), while MyHeritage does it for free. I suspect that if 23AndMe offered an option comparable to FamilyTreeDNA's, they'd triple the size of their database in short order. What is the significance of “shared centiMorgans”? Why might number of Shared Ancestor Hints go down on AncestryDNA? Are We Closer Kin Than First Cousins?